Dan May of BlackMagic (on right) receives the Award for Best Video/Broadcast or Video/streaming Product. 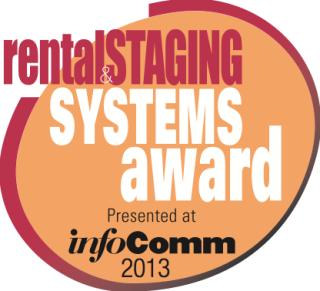 The 2013 Rental & Staging Systems/InfoComm Product Awards were announced and presented at the InfoComm show in Las Vegas on June 12th, recognizing the most innovative products released last year. The past year has been a very healthy one for the staging market, and the Rental & Staging New Product Award competition reflects that health, as the crop of entries represented the scope and variety of innovative tools used by professionals daily in this industry. The program, administered by Rental & Staging Systems magazine in conjunction with InfoComm, covers important applications from audio to high-lumen projection to video processing to the increasing use of digital signage for live events. LG’s 47-inch 47WX50MF Outdoor Display uses high-brightness Shine Out display technology, providing captivating and effective digital signage even in high ambient light. LG’s In Plane Switching (IPS) panel technology helps ensure accurate color saturation and contrast at wide-angle viewing and its built-in temperature control helps prevent dark blackening effects even when placed under direct sunlight and heat. The display has a brightness of 2,000 nits, full LED backlighting and 1080p Full HD picture quality in an open frame for easy integration options. The ATEM 1 M/E Production Switcher provides the workflow of a traditional 1 M/E SDI switcher combined with a portable two-rack unit size and software control panel that runs on a laptop. It includes 4 SDI inputs, 4 HDMI inputs, analog input, SDI, HDMI and analog outputs. On August 6, 2012, Blackmagic announced a major new software update that added full audio mixing capability to the ATEM 1 M/E Production Switcher, letting customers mix embedded audio from SDI and HDMI inputs, as well as external audio inputs. The update also supports mixing audio from its two built in media players. The latest version of Dataton WATCHOUT multi-display production and playback system enables the combination of stills, animations, graphics, video, sound and control and playback of live video feeds in a single impressive show across multiple display areas, soft-edge or scattered. WATCHOUT is fully scalable, software-based and requires no proprietary hardware. WATCHOUT can be combined with other systems and technologies such as touch panels or iPhones as an interactive front end to build entire presentation environments. Stewart Filmscreen’s Mystik! is a self-adhesive projection material designed for use in digital signage applications. Mystik! is ideal as a storefront application, as well as in other retail and public venues when a 2-piece projection solution is desired. It can be applied to any window or glass door to transform the surface into a translucent projection screen and easily deployed in venues such as retail outlets, trade shows, restaurants, museums, public spaces, and more.